At least once each ski season, my wife and I make sure to enjoy a meal at Deer Valley Resort. There are many terrific dining destinations there, ranging from the Seafood Buffet and Royal Street Café, to the fine dining at The Mariposa, not to mention leisurely meals at the Snow Park and Silver Lake Lodges, the Brass Tag, Deer Valley Grocery Café and more. I don't think there's a ski resort in the Americas that offers such stellar service and superb cuisine than Deer Valley restaurants do, as evidenced by the many national and international awards they've garnered for hospitality and overall quality. But, if I had to choose my single favorite Deer Valley dining location—and, thankfully, I don't—I'd probably pick Fireside Dining. Maybe one factor making it special is that if you blink, you'll miss it. Fireside Dining is a sort of seasonal "pop-up" restaurant located at Empire Canyon Lodge, only available at dinner time, Wednesday-Saturday during ski season. By mid-April, it will be a memory until the 2016-2017 winter season. By day, Deer Valley Resort's Empire Canyon Lodge is a good spot to escape the lunchtime throngs that tend to gather at Silver Lake and Snow Park Lodge. The Empire Lodge features grilled items such as paninis, burgers, housemade bratwurst, fish tacos, Peruvian chicken, Korean BBQ steak wraps, soups, pastas, salads, baked goods, brews and more. But at night during ski season, Empire Canyon Lodge morphs into Fireside Dining, offering guests a European Alps-style eating experience, with foods cooked at the Lodge's four large stone fireplaces. It's an all-you-can-eat affair ($63/adults; $30/children 12 and younger), but it's as far removed from Chuck-A-Rama or Golden Corral as you can get. You could eat lunch at Empire Canyon Lodge and return a few hours later to Fireside Dining and be hard-pressed to believe you're in the same location. A cocktail bar appears, and tables are adorned with fine wine glasses and other accoutrements, like candles. 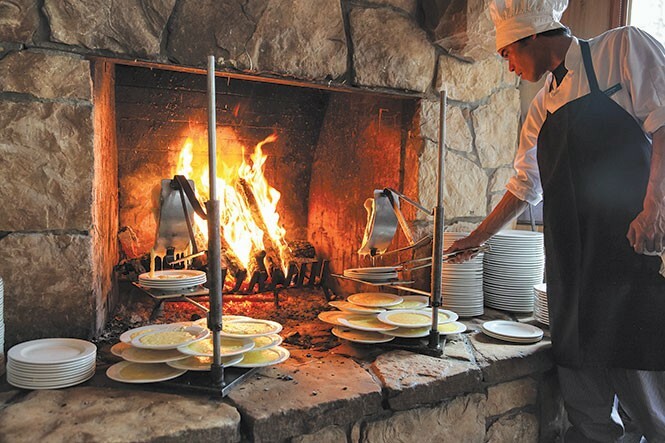 Fireplaces are turned into serving stations while an army of top-notch servers, cooks, managers and others—sometimes seemingly outnumbering customers—keep glasses filled, used plates removed and the entire buffet-style dining process humming along smoothly, despite the fact that Fireside is packed most nights. Guests are free to enjoy as much (or as little) from the huge selection of foods as they wish. Freedom is in force at Fireside, so if you'd prefer to kick off dinner with chocolate fondue-dipped fruit, so be it. My general recommendation, however, is simply to pace yourself. No one rushes you at Fireside Dining, and if you overindulge at the beginning of the evening, you'll hate yourself for not having room for dessert later. So, I've devised a method that works for me. First, I hit the raclette fireplace. Raclette is a firm cow's milk cheese popular with Swiss, French and German diners—one that melts very nicely. At Fireside Dining, one entire fireplace is devoted solely to raclette: Large half-wheels of it are loaded onto steel holders and the cheese is melted and scraped (raclette scraping is an art unto itself) onto hot plates, directly over the wood-stoked fire. I'm not above simply eating the cheese straight, right off the plate. But usually I enjoy raclette accompanied by Fireside's steamed new potatoes; cured Italian meats such as prosciutto, capicola, bresaola and salami; fresh-baked baguette slices; and garnishes like marinated pearl onion, cornichons, housemade fig mustard and strawberry chutney. That's just Step 1. While enjoying raclette, we peruse the wine list. It might surprise you, as it did me, but I'm always happy to see that mark-ups on wines are much fairer at Deer Valley Resort than at many Utah restaurants. There are cocktails, liqueurs and beer available as well, but the wine list is impressive—ranging from themed flights and wines by the glass—to bottles starting at $32. During our last visit, we chose an absolutely lovely Italian white wine from Italy's Piedmont region, La Mesma Gavi ($45). My second Fireside Dining destination is the "Alpine Favorites" fireplace. Weekly specials vary, but since Day 1, Deer Valley has offered its outstanding veal and wild mushroom stew: large, tender chunks of veal bathed in a creamy sauce with wild mushrooms including chanterelle, hen of the woods, shiitake and oyster mushrooms. Other common dishes served at the Alpine station include luscious Millcreek Coffee-rubbed elk short ribs with pearl onion, bacon and fresh thyme sauce; almond flour-dusted Utah trout in lemon-shallot sauce; grilled quail with pickled purple cabbage, bacon and Cognac-black currant au jus; and Italian "Peasant" soup with baby lima beans, spinach, yellow tomatoes and Fontina cheese. At this point, I'm usually tempted to return for more raclette (it's addictive). But, instead, in a rare exercise of willpower, I venture to the roasted leg of lamb fireplace, where whole legs are roasted directly over the fire and served with fresh thyme and rosemary lamb au jus, homemade apple-basil jelly and aquavit salt. The perfect accompaniment to the roasted lamb is Fireside Dining's "Mountain Macaroni," a decadent take on mac and cheese with penne pasta in a rich cream, Gruyère and raclette sauce with diced slab bacon and sliced onions. But wait, there's more! The fondue fireplace features warm, gooey, dark chocolate, caramel and white chocolate Grand Marnier fondues served with an array of fresh and dried fruits for dipping (I've determined that pineapple and dark chocolate is the heavenliest combination), along with cinnamon pound cake, cookie bites and almond biscotti. Other desserts include chocolate walnut pudding and apple-berry kuchen. You know what to do next, right? Yes, start over. Back to the raclette.